Cakespy: Has anyone gotten mad about your bakery's name? No offense of course, but some older New Englanders have a bit of a reputation for being...a bit uptight? Sara Ross: The only people gave me any lip (was) the phone company…“Kickass Cupcakes…errrr…I don’t think we can list that”. But they did. Most people are loving the name. For anyone who has a problem with it, we say you can tell your wee ones it’s “Kick Stars” or “Kick’s”. CS: When did you decide that you were going to open Kickass Cupcakes? SR: Was there one defining moment? I think I was having a really bad day at work, and it pushed me off the fence about whether or not I wanted to really open up my own business rather than be someone else’s bee-atch. CS: You're offering some unusual takes on the cupcake--cupcake "shooters", fried cupcakes, cupcake parfaits and cupcake crisps. Which of these products have been most popular so far? SR: We haven’t started doing the deep fried cupcakes yet, those will be starting soon, and we’ve been getting a lot of people asking about them. The Go-Go’s and the Crisps are really catching on now, especially the Crisps. CS: About those cupcake shooters. What exactly is a cupcake shooter? Are they cupcake flavored? SR: Shooters are one gulp cups of specially crafted beverages to down with your cupcake. Right now, we have a vanilla bean infused fresh from the local dairy milk, iced organic cinnamon tea and seltzer and syrup, choose your flavor of Sonoma Syrup and we’ll mix it up with a shot of seltzer. I recommend downing the shooter with your cupcake…licking sugar off your arm with your shot is highly recommended. CS: You offer deep fried cupcakes. Be honest...are they tasty? We're kind of curious, but kind of think we might go directly to hell if we ate one. SR: They are super tasty…who wouldn’t love a cream stuffed vanilla cupcake dipped in a sweet batter, deep fried to order, then drizzled with chocolate sauce...YUM! More like straight to heaven! CS: Has a person ever accidentally eaten a pupcake (your cupcake-shaped doggie treats)? Was it hilarious? CS: Where do your recipes come from? SR: My inspiration for the basics come from Rose Levy Berenbaum, the Queen of Cakes. 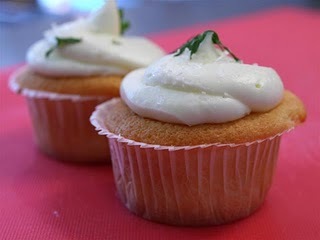 As for flavor ideas, that’s my favorite part of owning a cupcake bakery, coming up with new flavors of cupcakes. CS: Do you think vegan cupcakes taste as good as dairy ones? SR: Absolutely! Although they do have a different texture since they are oil and soy milk based (our other cupcakes are all butter based). The vegan cupcakes are luscious in their own way. In the Java Jolt, the chocolate and espresso really enhance the richness. And we just introduced a new seasonal flavor, Cinna-Punk, a pumpkin spice cupcake with cinnamon frosting. CS: Do you or will you ever offer any non-cupcake items on your menu? SR: I don’t think so, I’m too much of a purist. But I am tossing around the idea of doing a breakfast and lunch cupcake. For example, the breakfast cupcake could be a savory cupcake with eggs and bacon, or maybe a spin on French toast with maple syrup and bacon and the lunchcup could be a biscuit cupcake with butter and really excellent proscuitto and arugula. CS: Be honest...do you ever go home after a long day of making cupcakes with pure ingredients...and just break out the Twinkies or something? SR: OK, you got me…I love junk food, and lately I have been fixated on Pop Tarts. And candy bars, especially Butterfingers. I see it as a yin and yang thing…one must have balance in this world, or else it might explode. CS: What is next for Kickass Cupcakes? Any next-step goals? SR: Another location. I would love to open another location in Boston. 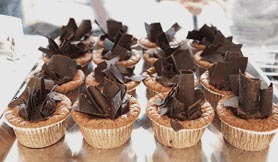 Kickass Cupcakes is located at 378 Highland Avenue, Davis Square, in Somerville, MA. For more information, visit kickasscupcakes.com.